After asking a few simple questions repeatedly in 2011, it turns out too many enterprises are cranking out mechanical risk management tasks without clear line-of-sight to actually managing risk to return. Risk management stuff was not only disconnected from summary financial measures of return, but also too often disconnected from key business performance measures. So it was no surprise that surveys at public programs revealed 1/4 to 1/3 of risk management spend is typically wasted (more in planning stages). As we reflect on 2011, it’s clear that lives and livelihoods depend on overcoming these problems. In discussions with a range of board members and executives, several causes begin to emerge. In this webinar, Brian Barnier draws on the analyses collected in The Operational Risk Handbook (Harriman House, London, 2011) from across industries, disciplines and countries to share practical insights on what works and what just wastes time and money. 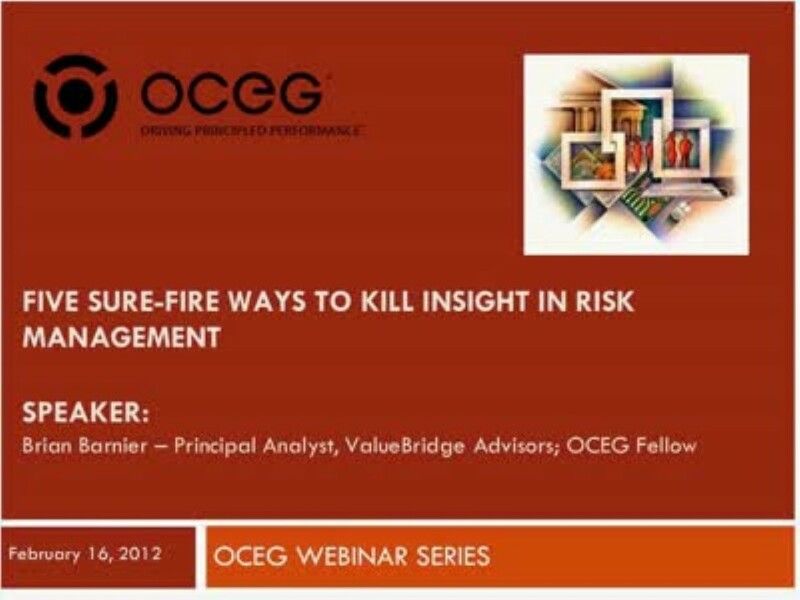 We have emailed instructions to access Five Sure-Fire Ways to Kill Insight in Risk Management to . Make sure the email arrives in your inbox: either add "support@oceg.org" as a safe sender to your email platform, or if you use Gmail, drag our email into your Primary tab.